If you have bedding and I suspect that you do ;-) the use of mattress covers (aka mattress pads) is a must for clean, healthy sleeping. Mattress sets are an expensive item to purchase and should be protected to get the maximum of comfort and use. Your needs are very different depending on if you suffer from allergies, bed wetting & spills, have children or pets, and depending how you use your bed. Do you watch TV or snack in bed? We all know what we should and and shouldn't do, and then there's what we really do. This is no time to be in denial. *Always	read manufacturers descriptions and instructions to know exactly	what you are purchasing and what is required to clean the mattress	encasement. Cover sizes are the standard twin, queen/full, and king but take your measurements to be sure. Some encasements are made specially with deep pockets to accommodate cushion top mattresses or mattress pillow toppers. 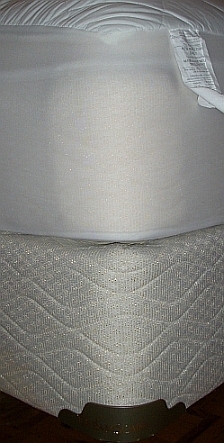 Most mattress protectors use either stretching elastic grip corner pockets like the one in this picture or a zipper closure that goes all the way around your mattress. Allergy	proof (aka hypoallergenic mattress encasements) covers are made	with high quality thread count fabric such as Cambric or Egyptian	cotton. These fabrics go through a special compression process that	make the weave very tight blocking out most allergens and mites. The	quality of hypoallergenic bedding products is reflected in the price	so keep a look out for sales. Some	mattress covers are specially constructed and have special zipper	closures that claim they can even block bed bugs! Not an easy claim	to live up to and, not having tested (nor wish to test) this product	I remain skeptical. If	you own a protected feather bed and don't have pets, or kids, you	should be well protected with a vinyl cover and still be	very comfortable. Add	a flannel blanket between a vinyl cover and your contour sheet to	add some comfort. The blanket will absorb some of the extra	moisture so make sure you wash the added blanket weekly along with	the linens. Fire	resistant mattress covers are a great idea but... Shame on you if	you smoking in bed! There	is a fire retardant mattress and box spring cover set available on	the internet but one customer review states that “they are for	prisons”. Not exactly a selling point. The good thing is	that patents are pending on such products so maybe we will find	something more suitable for family bedrooms out there soon. What ever you do make up your mind about what type of protection is best for you and get your mattress protected. Accidents happen quickly and time goes by even faster. If you put if off before long you will have a mattress spotted by stains and full of dust mites. Return from this Mattress Covers page to the Down Bedding Delights home page.